It seems that our world is filled with natural hallucinatory plant and animal life in spite of what governments do to cut off the supply. The news report was written as if the experience was so horrifying, the public is warned never to eat of this particular kind of fish for fear of it happening to others. One of the men, 40 years or age, was hospitalized because of frightening visual and auditory hallucinations that continued for 36 hours until they disappeared. He apparently did not require treatment. 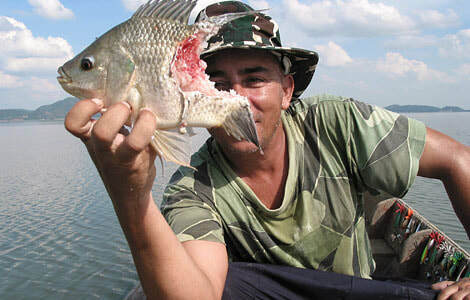 The story said the hallucinations can start within minutes of eating a poisonous fishhead and may last for days. There is no antidote. In both cases, there were no other issues and once the effects of the drug wore off, the men were just fine. While most people in the west would not do this, these gentlemen apparently ate the heads and certain body parts of the fish and got dosed with a natural form of a chemical called indoles, which accumulates in fish that feed on algae or phytoplankton found in the Mediterranean area. What these men experienced appeared to be similar to an LSD trip. It temporarily opened their middle eye and lifted the veil to what many shamans would identify as a hidden spiritual world. The visions and sounds experienced by the two became frightening because they did not understand what was happening to them. The hippies of the 1960s up to the contemporary followers of the Grateful Dead band, know all about LSD trips. Before the government banned LSD and made even its possession a crime punishable by prison, it was a popular street drug. Psychologist Dr. Timothy Leary proved through controlled laboratory experiments, that LSD (lysergic acid diethylamide) was not only a relatively safe drug, it proved useful in modifying or altering behavior patterns in habitual criminals, people with certain addictions, and other mental disorders. The government, however, determined that the drug was to be taken off the market and strictly controlled forever. Someone in high places apparently decided the public must not be capable of enjoying a hallucinatory experience. They did not want us to clearly envision the plastic world we have created for ourselves. It would be a popular means of escape, could possibly change people’s perspectives and consequently destroy the system of control that has been so carefully put in place. While LSD is strictly forbidden people may still legally eat the heads of these algae grazing fish and achieve a temporary “trip.” It is recommended, however, that anyone doing it be accompanied by someone experienced in using drugs like LSD so the experience is a positive one. The fish to seek are certain mullet, goatfish, tangs, damsels and rabbitfish. The natives called these the “dream fish,” for obvious reason. They have been consuming them for years and quietly enjoying the ride.